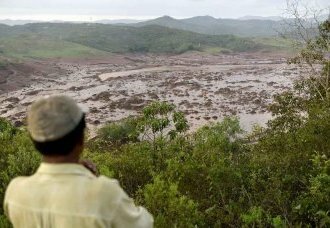 The collapsed Samarco dam on November 5th produced an estimated 50,000 tons of mud, which ran along the Rio Doce all the way to the Atlantic Ocean, and flooded the small municipality of Bento Rodrigues, in Mariana city. Towns along the river had their drinking water supply temporarily cut off due to possible contamination and entire communities of fishermen have been unable to work because of the contamination of fish and sea life. Brazil’s Federal Police accused Vale SA and its Brazilian joint venture with BHP Billiton Ltd of environmental crime, but there is no real charges till now, and this accident is considered by the government the country’s biggest environmental tragedy ever. Samarco is a joint venture between Brazil’s Vale and Anglo-Australian BHP Billinton. CSP-Conlutas managed a National Seminar to talk about this tragedy, and to demand job security for all workers, control of the company, control of profits and wealth, aiming to start managing and producing iron ore under social control of workers and mining communities. The tone of this activity was of complaint and claim, demanding security for workers, the company control in the hands of workers, as well as the production of ore and its riches, the re-nationalization of Vale and Samarco nationalization. On 2nd March, a Foundation, created by Samarco, Vale and BHP was signed to making possible to set the amount of compensation with each people who suffered with this tragedy. The foundation offers too lawyers to affected people that disagree with the compensation proposal. This means that the companies, responsible for the disaster and the human rights violations, propose and negotiate an indemnity value. If it is not accepted by the affected and indirectly affected people, Foundation lawyers can process Foundation itself. This mechanism directly contravenes the guarantees of due process. To demand justice to people of Mariana, CSP-Conlutas will be hold on 1st April a people’s court against the companies in charge for this tragedy. The event will take place in Minas Gerais, Mariana city.